“Well, let’s look at it this way: At least, this guy wasn’t buying a blowtorch. Infrastructure -What’s the Big Deal? Comments Off on Infrastructure -What’s the Big Deal? Comments Off on Which Way? I’m in a Tokyo hotel room, and there is a small chest of drawers. I usually open the drawer and put in my clothes if the stay will be more than one night. However, this drawer won’t budge. What’s the problem? The drawer has its handle on the top, as opposed to the bottom. This results in two face plants. The first is that we usually expect the handle (the opening affordance) to be on the bottom of the drawer. 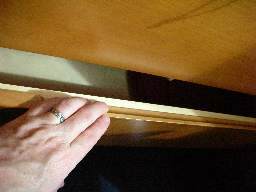 Since the groove is hidden when the drawer is closed, I did not see it until after I had tried to grip the drawer on the bottom. The second is that you need to press down in order to open the drawer. This causes it to press harder into the rails, and makes it more difficult to open. Place the groove on the bottom of the drawer. I’m not sure about this, but the drawer slider rail mechanism doesn’t seem to be very good. This may actually be damage done to it by months of being pressured. At this building I go to, I am always hearing a brief elevator emergency bell ring. I had never thought about it. We have the same elevators at my job, and I never hear it there. One day, I decided to give the matter a little thought, and I figured it out. What are the differences between the elevators at work, and these ones? 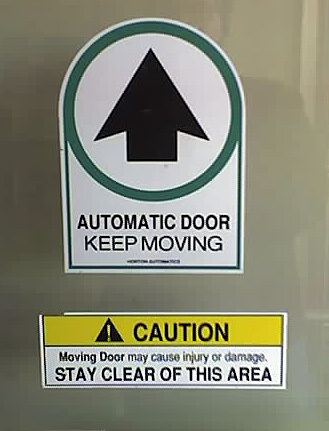 The doors close a lot more slowly on these ones. The ones at work close as soon as someone presses a floor button. The people only come here once a week, so they are not as familiar with the elevators as they would be at my office. Can you figure out why I keep hearing the elevator alarm bell ring? Last summer, they rebuilt the supermarket near my house. This involved knocking it all down, temporarily sending all the rodents over to my place, and then rebuilding a monster three times the size of the old one. This has been, for the most part, a rousing success, but I have noticed one sign of a rather poor planning process. The loading docks are behind the supermarket, on the East side. Trucks generally come in off the main road that runs North of the supermarket, down a side road that runs East of the parking lot, into the East entrance. After that, they need to do a fair bit of jockeying to back into the loading bays. If anyone has ever seen an eighteen-wheeler back into a loading bay, they know that it is a pretty complex project, with many back-and-forth runs. They can also come in the West entrance, and come up behind the supermarket. In that case, this happens only when they leave. Since the new supermarket is so huge, they had to substantially reduce the size of the parking lot. The trucks don’t have nearly the room to play with that they did with the previous lot. No problem. Truckers deal with this stuff all the time, you say. That’s why they get paid the big bucks. When they designed the parking lot, they underestimated the turning radius of the trucks, so the trucks are forced to go over the curb on the edge of the parking lot. This tears up the landscaping something fierce. After a good rain, the berm looks like a World War One battlefield (minus all the bodies). Those truck tires, and all that weight, are absolutely brutal. The problem, from this amatuer’s eye, seems to be that lampost island in the middle of the parking lot. It stands between the truck and the exit. It was obviously put there as part of a pattern. Maybe they were required to have these lights exactly that far apart by code, or maybe it was just a question of aesthetics. In either case, that torn-up grass is very ugly indeed. Cut a “notch” out of the berm. This is the easiest thing to do, but also the least effective. There would have to be a pretty big notch to accommodate all the trucks. You can bet that these drivers are going all out to avoid running over that landscaping, so you need more room than that represented by the tire tracks. 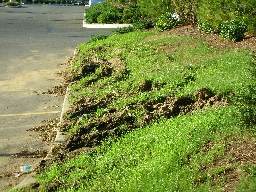 Reduce the width of the entire berm. This would work, but it is likely to cause problems. For instance a big part of the job of that berm is to hide the loading bays from the houses across the street. If the same height was maintained for the berm, and it was made narrower, the chances are very good that it would erode. Move the lampost further South, or further North. As I said, there may be a town code or something that says the lamp needs to be a certain distance from the other lamps, but I’ll bet not. I think the designer just thought it looked good on his/her blueprints. To be fair, I don’t know if I would have figured this out, but I’m not a professional supermarket designer, and they are. Remove the lampost island completely. They could easily mount a floodlight on the building itself, or on a post further East. I had quite a sobering experience the other day at the supermarket. Our supermarket has a neat feature at the deli counter. It’s a kiosk with a touchscreen that allows you to “pre-order” your deli order, then go about your business in the store. You come back later, and your order is ready. Very nice. The kiosk works by presenting you with options, while lecturing you in a voice that reminds you of that particularly pedantic English teacher you had, back in 6th grade. The voice explains your options S L O W L Y and clearly. This means that you are at each screen for several seconds. It usually takes a couple of minutes to make an order. Well, I made my order, went around and got the rest of my stuff, then came back to pick it up. It wasn’t yet ready, so I had to wait. As I was waiting, I watched the people using the kiosk, because that’s what I do. I watch people use technology. As he was waiting for each page to complete, he was absently picking his nose. With the same finger he was using to touch the screen. To make matters worse, just before touching the screen, he would absently lick his finger, exactly as readers do before turning a page. I don’t know about you, but I’m not using that kiosk again. Maybe I need to wear latex gloves whenever I go shopping. Note the teensy-weensy little left-click button. There is no right-click, which is OK. This is a “kiosk” system, so they want users to follow a custom navigation that the kiosk controls. Here’s the problem: The kiosk doesn’t know whether or not it’s a computer. What do I mean by that? Well, the program that controls the display is a custom Microsoft Windows NT-based system. 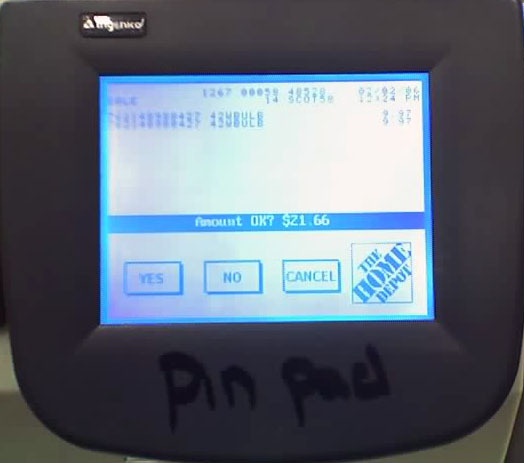 This is fairly typical of POS (Point Of Sale, not the…other…acronym) systems. The UI (User Interface) for the system is fairly standard Windows NT. The screen is pretty high-resolution, so it’s fairly large. It’s not a touchscreen, and even if it was, I wouldn’t use it. In any case, standard Windows UI is no good for touchscreen. The controls are far too small. You need to customize them for touchscreen applications. Obviously, the designers want you to use the keyboard for everything. It does work. The problem, though, is that there are a couple of dozen fields on the screen at any one time. When you get search results, you have long list of clickable links. You really need to move the cursor to places and click. I think it is safe to assume that the kiosk was designed with cursor movement in mind. If that is the case, why is the damn mouse button so small? I’m not particularly fond of trackballs as pointing devices, but I can accept them. However, that teensy-weensy little Smartie-candy mouse button is awful. In most stores that I have visited, the button is not particularly functional, and you have to click on it fairly decisively in order to trigger it. That is a real face plant right there. You need to “wake up” just a bit in order to select a field. 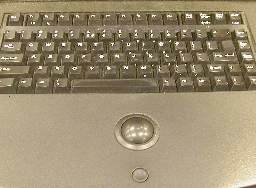 The concave design of the button aggravates this condition, as it is so deep that you may think the button has been pressed enough to work, when it has not been pressed far enough. The button is absolutely necessary for operation of the kiosk, yet has been made so small that it is non-intuitive, and hard to use. The concave design of the button is too deep. The button is recessed into the counter top, so you need to press into the counter top, but the concavity in the top of the button makes this difficult. Basically, it is hard to click on things. Make the mouse button larger. Make the mouse button rise above the counter top slightly, and reduce the concavity. I’m pretty sure the designers deliberately deprecated the mouse button because it was always accidentally being pressed. This would take some testing to get an acceptable shape. Redesign the UI to eliminate the need for a mouse, and remove the pointing device. Okay, I don’t like touchscreens, but that would be better than this. 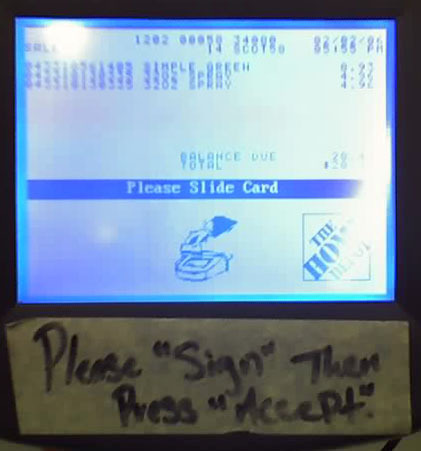 I was just shopping, and used a Home Depot electronic cashier. The people who shepherd the customers through the registers obviously got sick of the inevitable by-products of the bad design of the register software. I burst out laughing when I saw this, and I had to take a picture with my phone. It is an expression of frustration. However, the end result is that the cashier looks less professional. It’s not a good idea to look unprofessional when you are dealing with someone’s money. Can you see what happened? These electronic cashiers are arranged in a group of four, with a (usually bored teenage) cashier (“associate”) attending them. The instructions on the screen refer you to the “PIN Pad,” but most people know these as either “card readers,” or as “keypads.” The attendant obviously got sick of people asking “Where’s the PIN Pad?”, and wrote this up. In this case, the bad design was in the terminology. The electronic cashier I wrote about earlier had the same problem. Move the Card Reader to a more obvious area, as this is a “required face plant” that isn’t working properly. Label the Card Reader more neatly and professionally. I wanted to have phones throughout the house that could be used as an intercom, as well as a way to deploy phones into places where there was no wiring for phones. I checked around, and found that the 2.4 GHz system from GE seemed to have all the right buzzwords. The phones do everything they are supposed to do. I don’t especially regret getting them, but that is only because they were substantially cheaper than the other phone systems with the same features. Price was one of my principal factors. If I had paid more, I would have expected better design. Their look is OK. The handsets fit into cradles for recharging. Many phones with recharging cradles make it easy to insert the phone so that the charging contacts don’t quite meet, yet the phone appears to be seated correctly. These phones don’t have that problem. You just plonk the handset down into its cradle, and the charging light comes up. I think that the keypad is too complex and badly designed, but that is par for the course for all of these types of phones nowadays. The audio is clear and static-free. The range is fine for everywhere inside (and outside) my teensy little house. The intercom works fairly well, and I have the full complement of handsets (4). 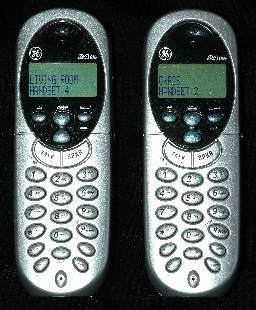 Each handset has a unique name that appears when using the intercom. When using the intercom feature, a loud, obnoxious beeping comes from the speaker on the other side of the earpiece. This beep is probably of a level high enough to cause hearing damage if listened to continuously. When an intercom is over, only one person should hang up. If both hang up, the second one to hang up actually takes their handset off the hook. The “Talk” button acts as both a “Talk” button and an “End” button. These are all incredibly bad design mistakes, and result in severe face plants. I had no idea that the phones would have these failings, and they probably would have affected my purchase decision. In order for an intercom to be effective, you need to have some way of getting attention. Usually, this is done via a ringer. Intercom-only devices tend to use the speaker, but people don’t usually hold those to their ears. These phones use the headset speaker (as I said, directly on the other side of the earpiece) to send out a loud beeping at maximum volume. To add insult to injury, both headsets beep while paging. This has an interesting effect. You (the person initiating the page) can’t easily figure out when the person you are paging answers the phone, unless you hold your (loudly beeping) headset to your ear. When the other person picks up the page, the beeping stops. However, if you are not holding the headset to your ear (I recommend against holding the beeping headset against your ear for medical reasons. ), then you won’t hear exactly when the other person picks up. You need to wait a half second or so for the beeping to stop, and then spend a second or so bringing the headset to your ear. This results in an awkward pause at the beginning of each intercom session. We’ll start with Gripe #3: the fact that the “Talk” button is both pickup and hangup. This will segue into Gripe #2, and help to frame the issue more clearly. Almost every phone on Earth has a separate button for “Talk” and “Hang Up.” There’s a reason for that: People think of them as two different operations, not as two different faces of the same operation. When I first got the phone, I suffered a MAJOR face plant as I tested the phone. I clicked on “Talk,” and got the expected dial tone. I then clicked on the button that, in every other phone I have, including cell phones, is the “Hang Up” button (usually called “End,” and clicking this button when the line is on the hook results in the phone hanging up. If it is pressed when the phone is already hung up, it either does nothing, or restores the phone to some default state). In the case of this phone, I was quite surprised to suddenly hear the dial tone blaring out of the speaker on the back of the phone. I looked at the keypad, and saw that the right-hand button was labeled “SPKR.” Silly me, I accidentally activated the speaker instead of hanging up. I guess you need to click on the “Talk” button to hang up. This was a conscious decision. I guess that they decided that the speakerphone capability was one of the “core features” of the handset, and gave up one of the “prime real estate” buttons for it. I don’t think it was a particularly correct decision. A lot of bad came about as a result of this one decision. Now, to Gripe #2. When you intercom someone, they pick up their handset, and press their “Talk” button. Their handset stops beeping. They then put the handset to their ear, and hear…nothing. This is because of that awkward pause I mentioned. After you realize they have picked up, you talk with them, and then, it comes time to hang up. Whomever hangs up first actually hangs up their handset, and ends the intercom session. Remember how they do that? That’s right. They press the “Talk” button. Say the person on the other end hangs up first. You then hang up, because that’s only natural. Remember how you do that? That’s right. You press the “Talk” button. Remember Gripe #3? That’s where I complain that the “Talk” button is used to do both picking up and hanging up. Now, you are hanging up. Except that the person on the other end already hung up, so your phone is hung up. You press the “Talk” button. Guess what? You just took the phone off the hook. If, as I do, you keep the handset in a pocket, or on the table near you, instead of returning it to the charging cradle, you will put the phone down, with the line off the hook. You’ll figure it out as soon as the “off the hook” alarm goes of in a minute or so. This has resulted in an impromptu protocol. When we intercom, we end the conversation by agreeing who hangs up. The one single design decision to make the “Talk” button act as both a “pick up” and “hang up” button, caused the worst face plant I’ve experienced in a long time. That whole “trying to hang up the %$#@!!! phone” ordeal. This also has forced our family to develop an annoying “protocol” to what is supposed to be a simple conversation. The fact that the initiating handset beeps during an intercom call causes a real bit of awkwardness in a simple intercom. Have the “SPKR” button moved to a less prominent place, and replace that button with an “End” button. True, if you wanted to promote the speakerphone as a “core feature,” this would scrag that, but I think it would be well worth it. Have the recipient of an intercom call beep loudly, and have the initiator beep softly, or flash the display backlight. This would make the phone’s intercom feature (one of the principal reasons I purchased the system) far more usable.